Aerial view of the new, wider beach at Cardiff State Beach. On Tuesday, July 17, local elected officials, community stakeholders, and agency representatives descended upon Cardiff State Beach to celebrate the recent completion of the beach sand replenishment and shoreline protection work on Cardiff State Beach in the City of Encinitas and Fletcher Cove in the City of Solana Beach. The event also celebrated national recognition from the American Shore and Beach Preservation Association (ASPBA). Cardiff State Beach, the only beach to be selected along the west coast, received the prestigious Best Restored Beach Award from the ASPBA. The ASPBA created the Best Restored Beach Award as a way of highlighting the value of restored beaches, given that the preservation of beaches and shoreline protection is a priority among coastal residents and tourists. The Cardiff State Beach portion of the sand replenishment project was chosen for this award based on the overall ecological, economical and long-term success of the project. Beach sand replenishment and shoreline protection work began at Cardiff State Beach in February 2018. Crews largely completed the replenishment work in April 2018, placing nearly 300,000 cubic yards of sand on the beach before moving operations to Fletcher Cove. 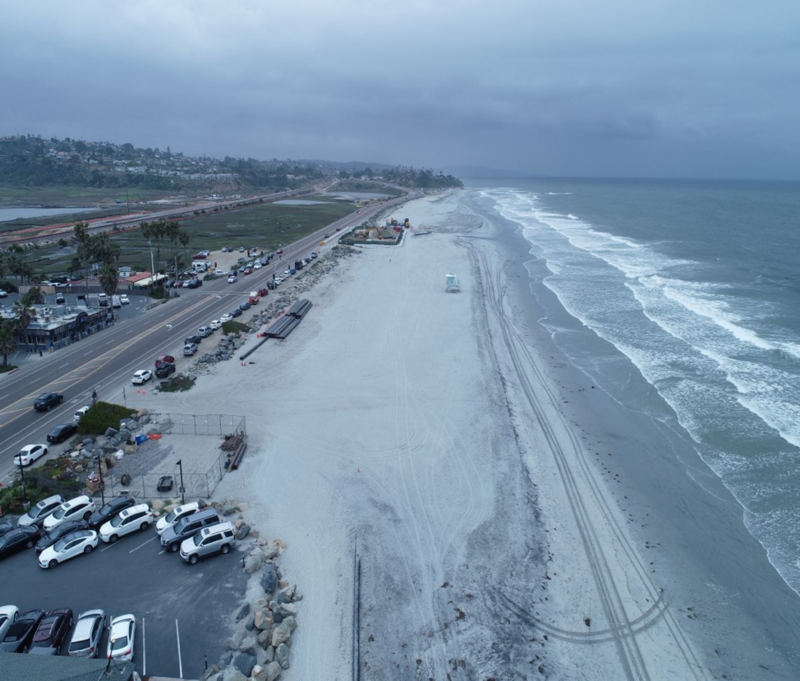 A total of 440,000 cubic yards of sand was dredged from the San Elijo Lagoon and placed on the two beaches as part of the San Elijo Lagoon restoration project, an ongoing $118 million effort to enhance the wetland and upland areas and improve tidal flushing in the lagoon. In addition to restoring the lagoon, approximately 250 acres of open space and sensitive habitat have been preserved and/or enhanced as part of the North Coast Corridor (NCC) Program. The San Elijo Lagoon restoration construction efforts are led by Caltrans, overseen by the San Elijo Lagoon Conservancy, and funded through TransNet, the regional half-cent sales tax for transportation administered by the San Diego Association of Governments (SANDAG). The lagoon restoration is one element of the NCC Program, a 40-year, balanced set of transportation, environmental, and coastal access projects to improve the quality of life for residents, create a stronger local and regional economy for the future, and enhance the coastal environment. The NCC Program was unanimously approved by the California Coastal Commission in 2014. The lagoon restoration also is a component of the $850 SANDAG Environmental Mitigation Program, which was established to provide for large-scale acquisition and management of critical habitat areas. Build NCC is a collaborative effort between SANDAG, Caltrans, and United States Department of Transportation. Build NCC is the first phase of construction in the cities of Solana Beach, Encinitas, and Carlsbad as part of the North Coast Corridor Program. Build NCC includes extending the existing HOV/carpool lane on I-5 in each direction from Lomas Santa Fe Drive to State Route 78, double tracking the rail line and replacing the highway bridge at the San Elijo Lagoon, replacing the rail bridges at the San Elijo lagoon, restoring the San Elijo Lagoon, and constructing nearly 10 miles of new bike and pedestrian trails. Construction on Build NCC began in early 2017 and will be complete by 2021.